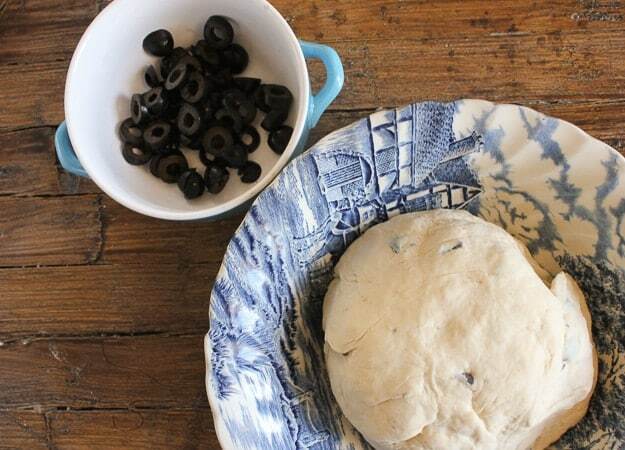 Do you love Homemade Bread and black olives? 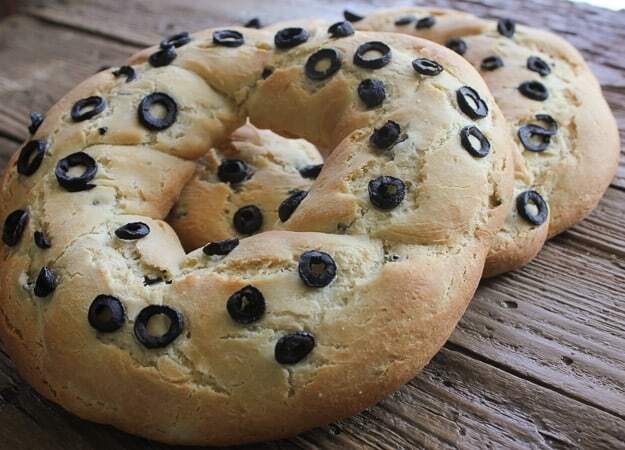 Then you are going to love this tasty Mediterranean Crusty Black Olive Bread made with lots of sliced olives. This is nothing like bread baking in the oven, especially Olive Bread, what an amazing smell and then that taste! Delicious. Lately I have been making different kinds of breads, I have always made my own pizza dough and once in awhile focaccia. But when I do make bread I always ask myself “why don’t I do this more often”? It is quite easy, not too much work especially if you use a machine with a hook attachment. Which I must say is what I always fall back on these days. Let the machine do all the work, and then wait and watch it grow! Besides, the outcome is so worth it. There really isn’t anything like fresh baked bread just out of the oven. I have always been one of those people who isn’t that crazy about certain foods unless they are dunked, dipped or stuffed into something. For example nuts, only covered in chocolate, thank you very much. And of course olives, by themselves? Never! I once heard you have to eat 7 olives and then you will love them forever, I am afraid to say I never got past the first one. More Homemade Bread Recipes you may enjoy! 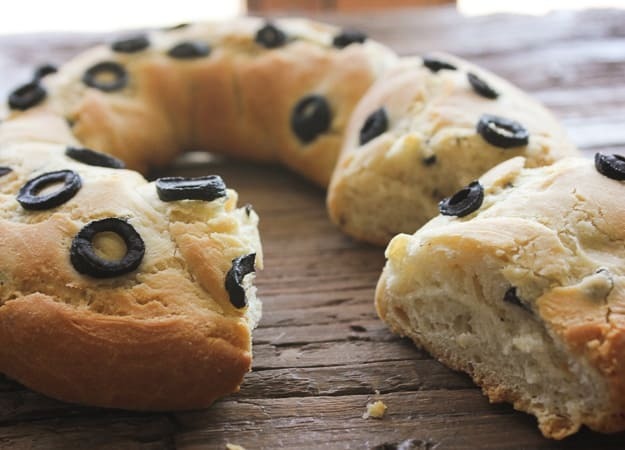 But sprinkled on a pizza or added in this amazing Olive Bread dough and of course don’t forget to sprinkle some on top, and it becomes one of our favourite baked breads and I hope yours too! 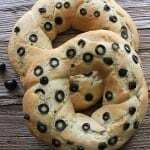 This Olive Bread is a great accompaniment for lunch or dinner or just ask my daughter, she ate almost half of it by itself for a snack. Buon Appetito! Olive Bread, fresh baked bread, yes you can and it is so delicious and so easy perfect with any meal or on it own. In a small bowl add water and yeast, let sit for 2-3 minutes then stir to combine. In a large bowl whisk together flour and salt, then add water and yeast mixture, 2 tablespoons (30 grams) olive oil and 1/2 the sliced olives. Mix together. On a lightly floured surface (add a little flour when needed, so dough doesn't stick) place the dough and continue to knead, approximately 10-15 minutes until dough becomes smooth and elastic. Place in a large bowl, cover well (I always use a folded tablecloth) and let sit 2-3 hours until doubled in size. 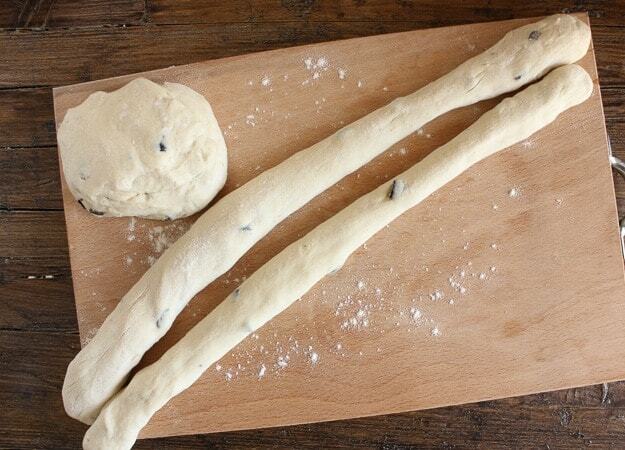 Remove from bowl and punch dough down and knead a few times, divide dough into 4 parts. Roll each part into a 17 inch (45 centimeter) long rope and gently entwine two of them together and unite ends to form a circle. 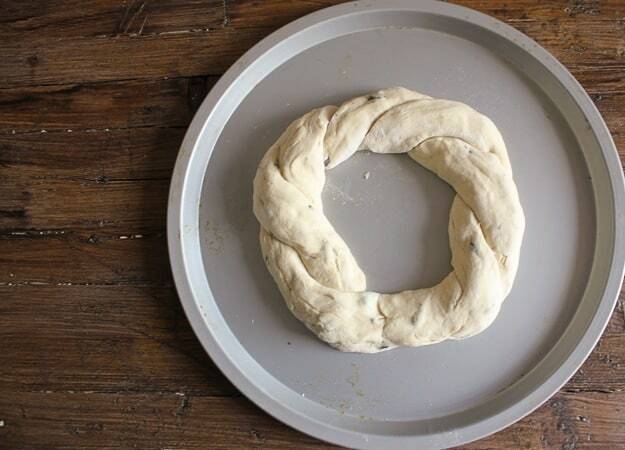 Place each circle on a cookie sheet, cover and let rest for another 30 minutes. Pre heat oven to 425° (220° celsius). 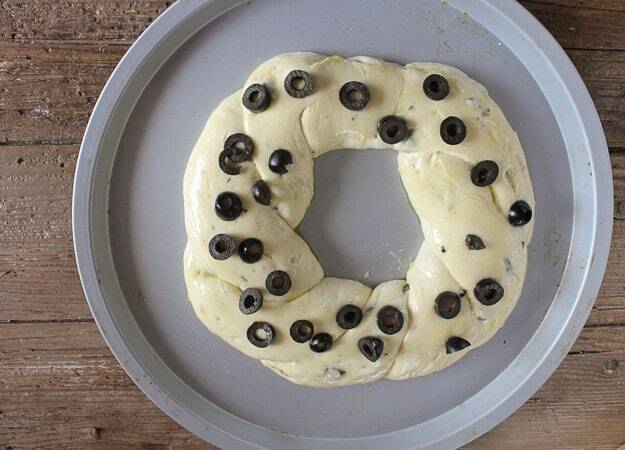 Brush each circle with the remaining olive oil and sprinkle with olives. Bake in oven for approximately 30 minutes. Enjoy! What type of flour is used? Can I use all-purpose? Hi Jenna, yes you can use all purpose. That’s what I use. Hope you like it. Hi Lois, yes you are correct, it should be 1 3/4 teaspoons, thanks again I have corrected it. Have a Happy Easter. This looks so amazing! I can’t wait to try this, thanks for sharing. Hi Nina, let me know when you make it. Have a great Sunday. I HAVE BEEN “ITCHING” TO MAKE OLIVE BREAD FOR A WHILE NOW. I THINK YOUR POST MAY HAVE JUST GIVEN ME THE PUSH I NEEDED TO START BAKING! LATELY, I HAVE BEEN EXPERIMENTING WITH THE “NO KNEAD” BREADS. YOU SPEND ABOUT 7 MINUTES MIXING A DOUGH (ABOUT 4 LOAVES WORTH), THEN PUT IT IN YOUR FRIDGE. WHEN YOU WANT BREAD, GRAB A HUNK,, SHAPE IT, AND LET IT RAISE–THEN BAKE. DOUGH WILL KEEP FOR ABOUT 2 WEEKS. I LOVE THE CONVENIENCE OF IT!!! Hi Diane, I have never heard of that bread, what a great idea. Hope you enjoy this bread. Thanks. 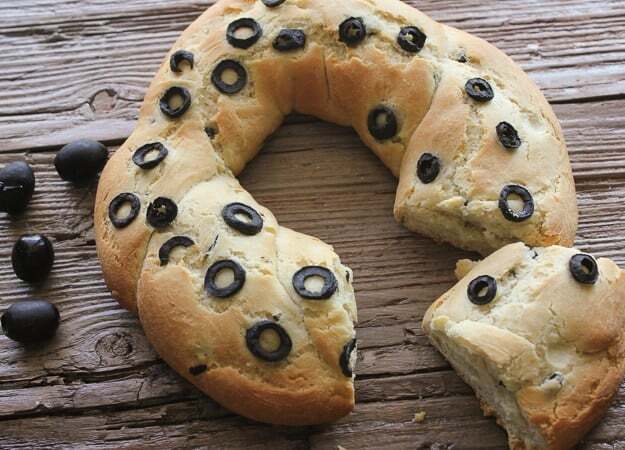 I’ve never had olive bread before…looks amazing. I love olives…all kinds, even the ones with the peppers inside! I eat them alone all the time, lol so I know I’ll love this bread! Hi Veronica, hope you enjoy it. There is nothing like the aroma of bread baking to make a house smell warm and welcoming. I miss baking bread when we’re away from home. Now olives is a must on salad for my Hubby. I can take or leave them although I do enjoy them occasionally. 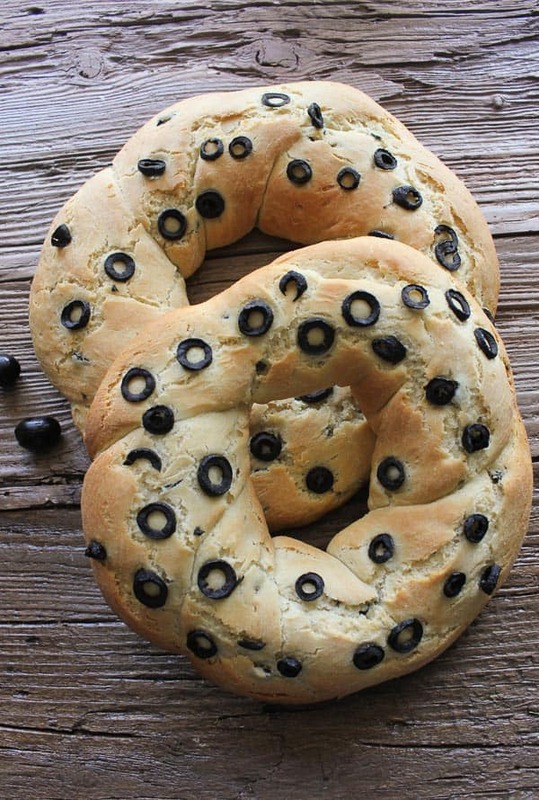 Your bread has the best of both — my love of baking bread and my Hubby’s craving for olives. I will enjoy baking this bread. Thank you!! Hi Marisa, thanks, my kids and my husband all love olives, they can eat them like popcorn! Hope you enjoy it. Have a great weekend.